I need to start posting more on local news, and especially one critical piece: the federal government will pick up $2.97 million toward the Dryden wastewater treatment plant rebuild with another $3.64 million loan. That's been a long long story, one that goes back well before I started writing here. I'm very glad stimulus funds will be helping Dryden, though not happy about the economic plunge that made those funds available. There's also a new Dryden Town Talk today, on a high school photographer, Shakespeare workshop, and flu shots. Also, if you want to hear what Town Board Member David Makar has to say about Marcellus Shale gas drilling, WHCU has posted an interview recorded yesterday. Our Congressman, Mike Arcuri, will be holding a town hall meeting on healthcare at the Varna Community Center (map) tomorrow, September 11th, from noon to 1:30pm. Congressman Mike Arcuri came to Varna yesterday because he "wanted to come home and get beat up by my constituents - right, left and center." While it was definitely a very civil town hall event, without much beating up, we definitely heard from right, left, and center. I was happy to see a lot of Dryden residents in the mix, and most of the questions and comments came from people who actually live in Arcuri's district. 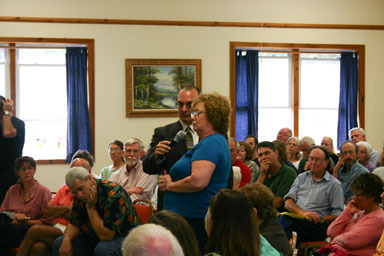 Mary Ellen Bossack tells stories of health insurance frustration. Tim Foote asks about buying insurance across state lines. 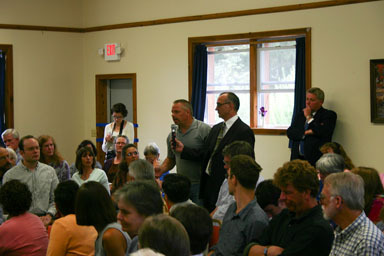 Mike Arcuri answers a constituent. 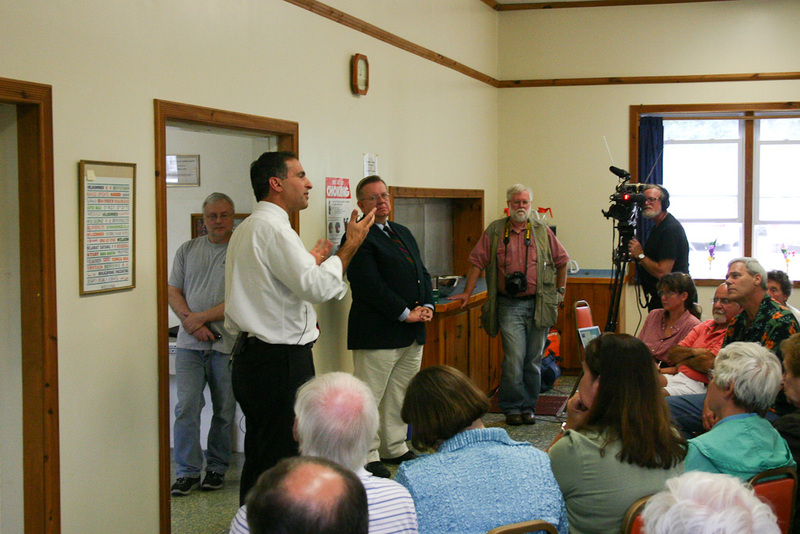 Nearly all of the questions were about healthcare, though the very first question was about Marcellus Shale natural gas drilling. I've posted an audio recording (QuickTime, 21.7MB) of almost the whole event (I stepped in a few minutes late). It does well when people were using the microphones, not so well when they weren't. I'll see if I can get a transcript made. The Ithaca Journal's posted an article, as did WHCU. Update: you can now see video as well. The Saturday after Labor Day is always a busy day in Dryden. I was worried Friday night about rain, but the rain came overnight, leaving the Freeville and Ellis Hollow events with a gray but dry day. After buying a Veg-O-Matic, complete with instructions and original April 1974 receipt, at the Etna Community Center's rummage sale, Angelika and Sungiva and I visited the Freeville Harvest Festival. Sungiva explored a slide and had a fun time wandering around, while Angelika and I focused more tightly on the chili cook-off and the desserts table. 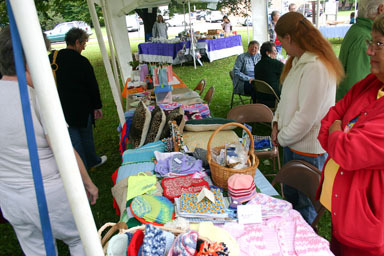 Busy crafts table at Freeville Harvest Festival. We enjoyed the festival as always, and I've posted a gallery of photos so you can see more. 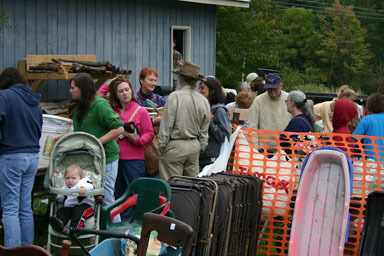 Next up was the Ellis Hollow Fair, which was just getting started. After checking in at the Dryden Democrats' voter registration booth, I wandered around the fair for a while taking pictures and talking with people. Arriving at the Ellis Hollow Fair. 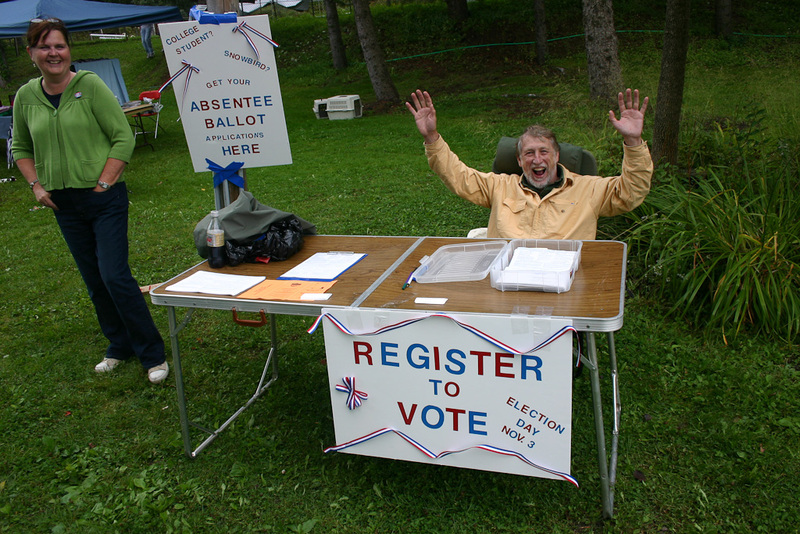 Jim Skaley is excited about voter registration. I spent much of my time at the fair helping out in the Country Kitchen, serving hot dogs, hamburgers, and sausages. I'm happy to report that all four candidates for Dryden Town Board - myself, Deb Shigley, Steve Stelick, and Jason Leifer - worked there for a few hours. 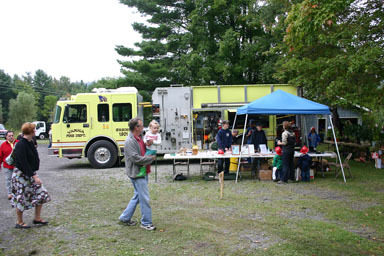 We all got along, serving lots of customers tasty food with minimal delays. The County Health Inspector came by at one point, and the Country Kitchen passed the test. I think customers were happy too! I've also posted a gallery of photos for the Ellis Hollow Fair. I know there are signs up in Dryden for the county legislature primary between Mike Koplinka-Loehr and Peter Stein, and that some people in Dryden even received mailings about that race, but that race is in the Town of Ithaca, not in Dryden. Our regular elections will, of course, be held November 3rd. The Dryden Town Historical Society is planning a genealogy workshop run by members of the Genealogy Committee. The program is suitable for all levels of experience (beginner, novice, or Pro). There is no charge and materials will be provided for record keeping and research. The one-day workshop will be scheduled for October (participants will be notified of the date). Anyone can participate but space is limited and preregistration is required. 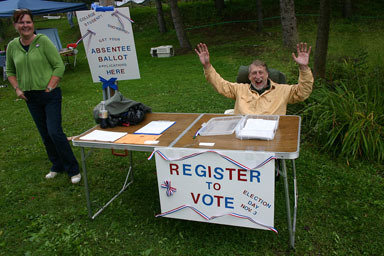 The deadline for registration is September 22, 2009. Contact Don Smith at 753-1001 or by email: dsmit22@twcny.rr.com. Through an orchard full of black caps and other pointy plants. 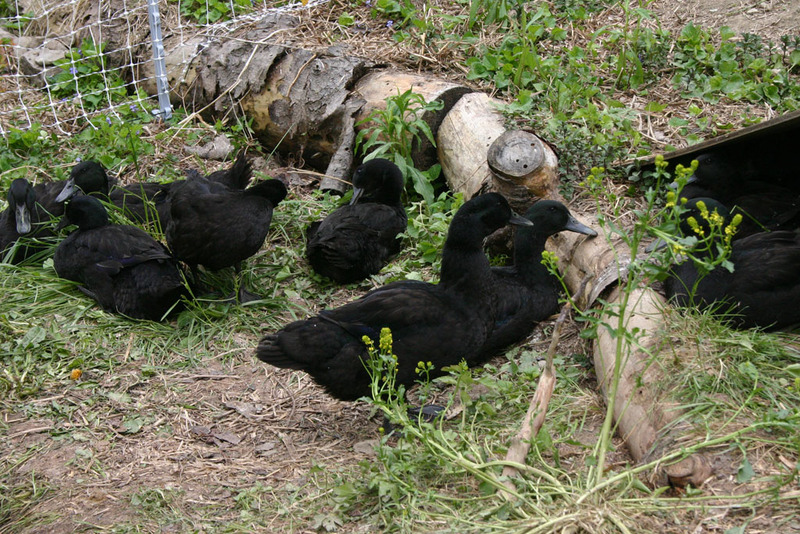 Our Cayuga ducks are great, but get more and more invisible as it gets darker. Every now and then we need to move them from place to place, which requires catching them. They'd spent a long time in our front yard orchard, and it was time for them to find a new home. Today seemed like a great day for it until that round of storms ate our remaining daylight. 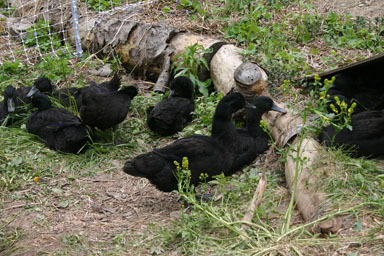 Cayuga ducks resting on a sunny day. Oh well. I should probably watch some Daffy Duck cartoons now. I think our ducks are smarter than him. Certainly better at escaping! I started my day by standing in line this morning. 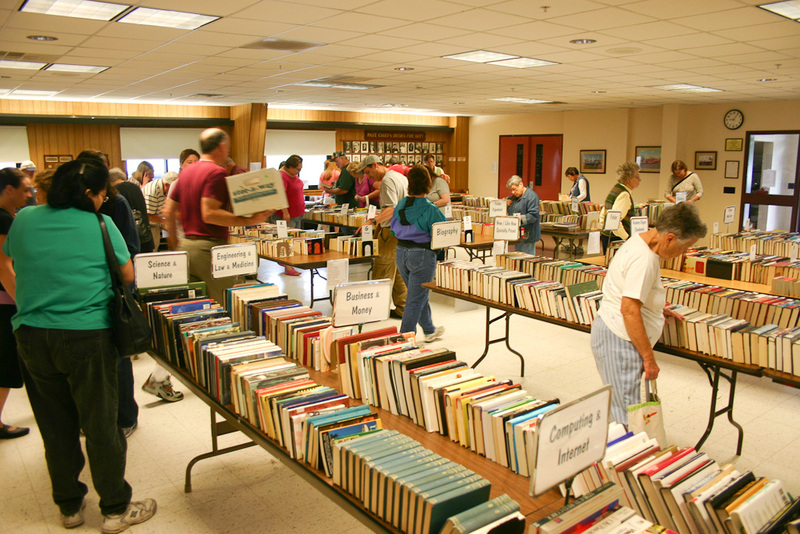 The Southworth Library is having its annual book sale today, tomorrow, and Saturday at the Dryden Fire Station - 26 North Street, Dryden (map). Today they're open until 8:00pm, tomorrow they're open from 9:00am to 8:00pm, and they're open Saturday from 9:00am to noon. The selection was great - lots of good books, conveniently organized, without being overwhelming. I stuck to a few books for Sungiva, as I have far too many books for my bookshelves right now. Want to see more? I've also posted a gallery. Sungiva enjoys a book from the Southworth Library Book Sale. I haven't been following the dwindling Ithaca Journal as closely as I used to, but this morning I was a little surprised to see two Dryden water systems under boil-water notices. One is off German Cross Road, the other off Kirk Road. Hopefully they'll get these issues cleared up quickly. There's also a piece on New York's old laws for assessing dog attacks on livestock, which I first heard about when trying to figure out the "Dog Surplus" line in the Town of Dryden budget. It's ancient, and apparently strangely enforced, but still a real issue. New York: great place for investment? Yes, I know. New York State, once on the cutting edge of American invention and industry, has been losing business, especially manufacturing, to the Sunbelt and other far-off places for decades. We're not the special place we once were when our transportation advantages mattered, and New York City often seems like the main place in the state whose critical mass keeps it moving forward. Low-tax states are the ones seeing all the new business development, right? Well, it's not that simple. California and Massachusetts have maintained thriving high-tech corridors despite their being high-tax states. (Remember "Taxachusetts"?) While low taxes could be a plus for those already making profits, there are a lot of other factors that go into centers for innovation. Communities of people with the right training, both in business and in tech, are central, and while having a large employer can be a good thing, a broader ecosystem of smaller companies makes it easier to sustain community in fields where even great ideas don't always make it. I've never really thought of New York as playing on the same field as California and Massachusetts, though there was certainly a boom in New York City's "Silicon Alley" when the dot-com boom was taking off, and Tompkins County, though far from urban centers, has long had a lot of entrepreneurial energy flowing out of and around Cornell. Venture capital comes here from afar, and I understand there's also been some substantial local venture capital as well. For a state that dreams of returning to Empire status, but constantly imagines itself to be collapsing, that's a rare positive sign. There's a lot more information on the detail page for New York, and the site where this came from has a lot more detail on the ups and downs of venture capital. One other interesting aspect of this is that I found the data through a blog post complaining about the low level of investment in Illinois, another state with similar polarities to Upstate-Downstate and a city (Chicago) that seems unlikely to slow down easily. Somehow, though, we're outpacing them easily by this measure. The Tompkins County Health Department had scheduled a flu vaccination clinic at the Varna Community Center for this Wednesday the 30th and another at Bethel Grove Family Center, but they've been cancelled because of a vaccine shortage. Sungiva's a year and a half! 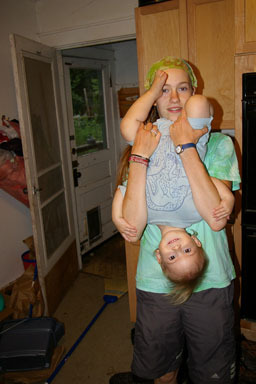 Sungiva celebrated her eighteenth birthday yesterday, well, eighteen months. We haven't posted pictures in a while, provoking all kinds of protest, though I don't think Sungiva herself has really noticed. We have a bit of catching up to do, so this gallery includes three months worth of pictures. This time, some of them are from my mother, and others were taken by Mirjam Bögelein, a German student who stayed with us for six weeks this summer working on her English. 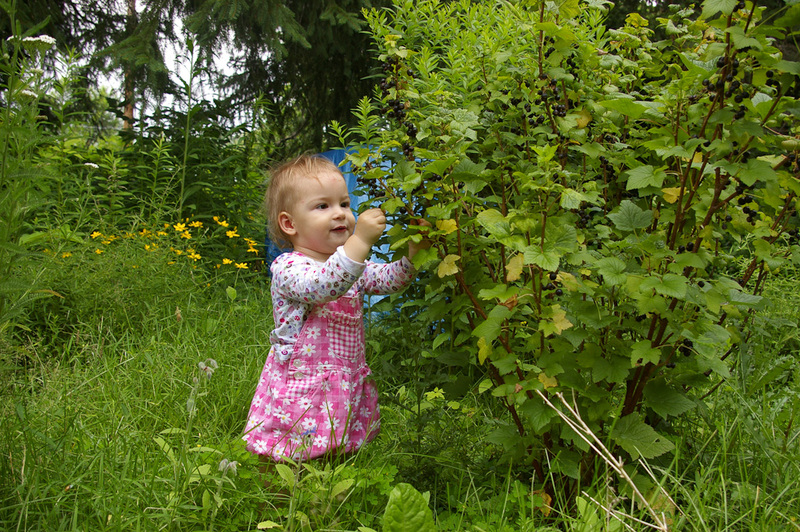 Sungiva enjoys currants, fresh from the bush. As always, there are a lot more pictures in the gallery. Sungiva's doing beautifully. 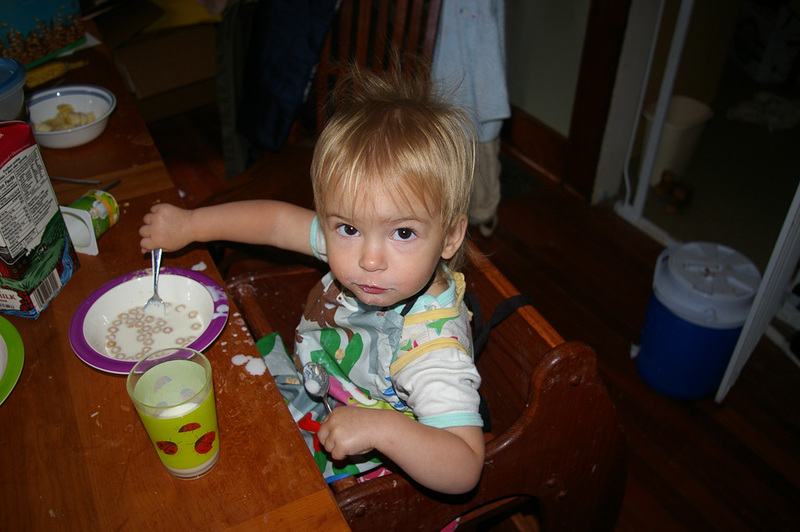 September was a month of major chaos at our house, as we finally got to addressing foundation issues I probably should have dealt with, oh, about when I bought the house. 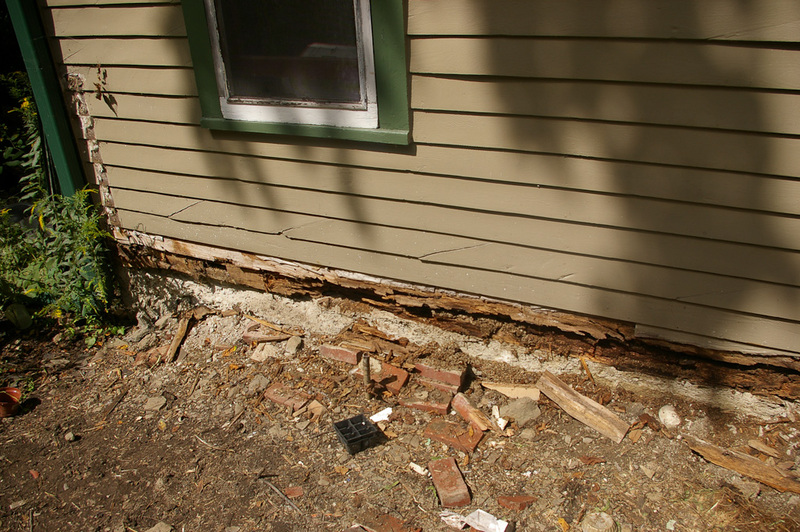 A serious lack of drainage led to crumbling concrete and a rotting sill beam. Addressing that, unfortunately, was both expensive and disruptive. 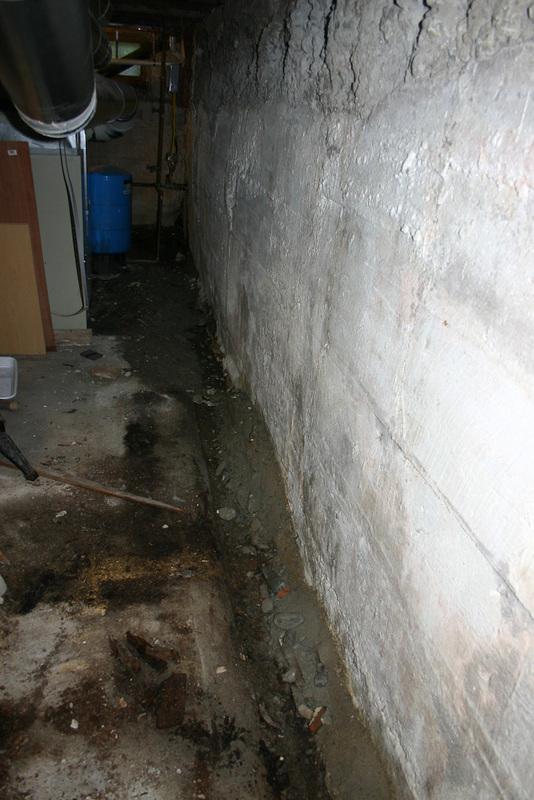 With the new drainage and the foundation and sill repaired, though, I have a lot more confidence that my house is here to stay, plus the bonus of a much drier basement. We sought estimates this spring. The hardest part was getting people to return phone calls and actually come look at the place, but in the end we accepted an estimate from Sunny Brook Builders, and they started only a couple of weeks late. 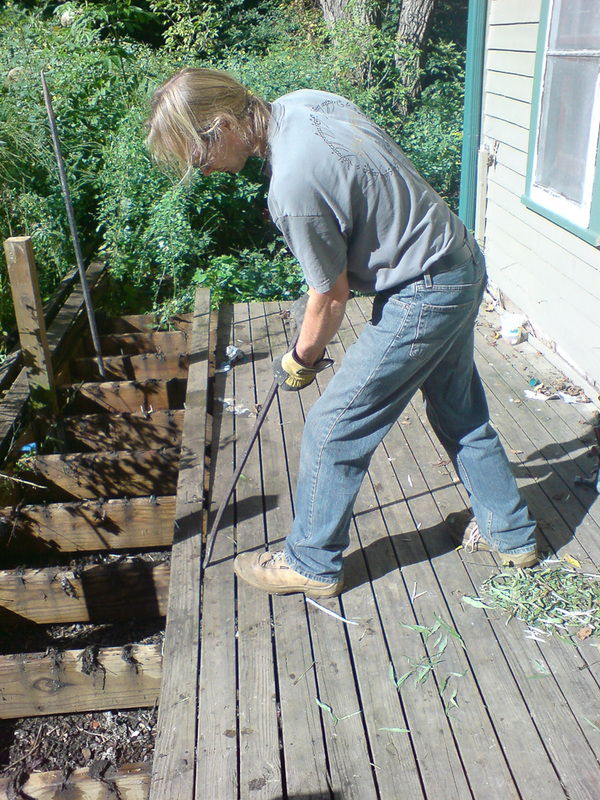 The first task was ripping the deck off the back of the house. 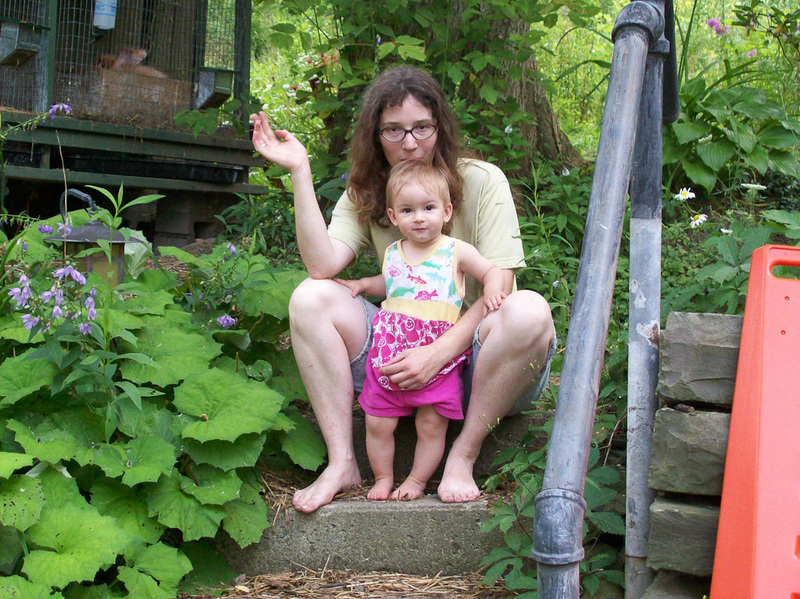 The deck had pretty much always been my least favorite feature of the house, somehow big enough to be inconvenient while too small to be useful. It turned out to be easily removable, though. Dan, the carpenter from Sunnybrook, demolished it in a morning. Dan pries off the deck surface. 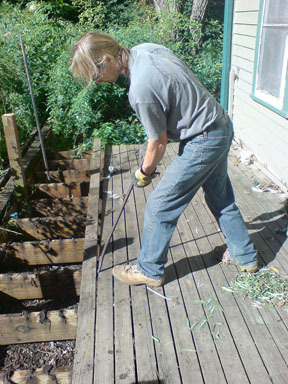 Getting rid of the deck (I didn't want to keep it) left us with two problems. First, of course, is the long-term question of what to replace it with. Our budget required postponing that for later consideration. 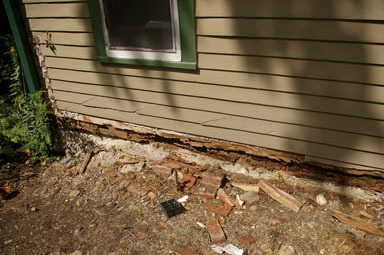 Second, it revealed just how extensive the damage to the sill beam and concrete was. Rotten sill and crumbling concrete. The next step would be excavation, to put a new drainage system in behind and along the house. "If it sounds too good to be true, it probably is," he said. "Really and truly that's the way (to tell a scam)." In Caroline Town Talk, Patrica Brhel notes the 50th anniversary celebration for Caroline Elementary School this Friday, October 2nd, from 5:30pm to 7:00pm. 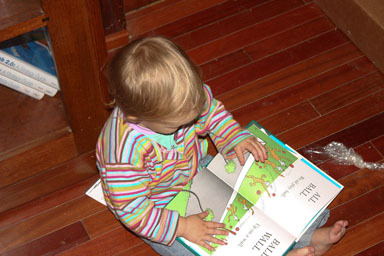 Most elementary school students who live in the Ithaca City School District's corner of the Town of Dryden go to Caroline. The Journal also notes this weekend's Green Buildings Open House & Tourlist of homes on the tour includes two places in Dryden: one on North Wood Road, and one on Midline Road. It's also not clear how the county economy is doing amidst a pretty dark national picture. On the opinion page, there are two letters supporting Mike Lane's run for County Legislature, one from Wendy Martin, and one from Fred Gentz. The underlying problem with my foundation was water. I can't imagine trading life in Dryden for life in the desert, but it's a little hard on buildings. Whoever built my house eighty years ago (maybe Lloyd Bell?) doesn't seem to have included any external drainage system at all. Instead, water flowed through a trench along the back and side walls of the basement, draining through a tarpaper pipe to the ditch out front. The trench inside my basement. Making sure that this project would last required giving water another place to go. That meant excavating around the south and west walls, and installing drains and pipes. 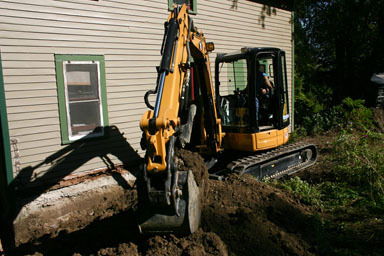 To do that, Sunny Brook Builders brought in Cross Excavation & Auger. Two people, Daryl Cross and his son, with two machines, some pipe, straw, gravel, and sheeting managed to fix the heart of my house problem in a day. Digging a trench along the house. 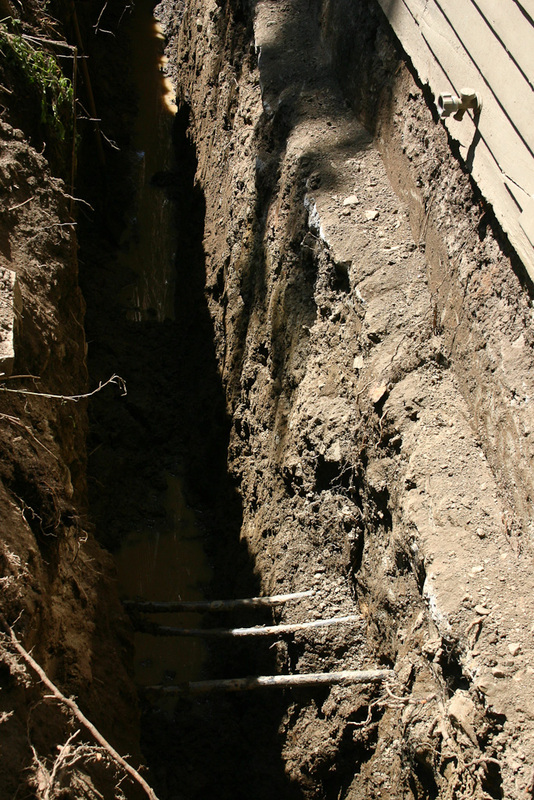 Well connections across the trench, going into the stone and concrete foundation at right. Among other things, they found the old well for the house - not the current 270' deep well that's still connected to the garden hoses, but a shallower well a few feet from the foundation. They dug a foot or so below the bottom of the foundation, and ran drains along the corner, back, and side of the house. 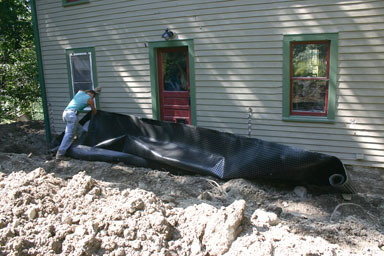 Putting the liner against the foundation. The impact on the basement was immediate. The trench stopped running that day, and over the next few days the areas on the floor that had always stayed wet began drying out. My dehumidifier, which had been limping for a few years, seems finally to have stopped working entirely, but fortunately I don't need it nearly as much as I did. I'll likely replace it, but with a smaller and simpler one now that it will only have to deal with an ordinary basement, instead of a swamp. They'll be returning to finish filling the excavated area once it's settled and the rain takes a pause, the last piece of work yet to be done. I've posted a much more extensive gallery of the drainage work if you'd like to see more. It's here - the 809 page thriller everyone's been waiting for: the New York State DEC's Draft Supplemental Generic Environmental Impact Statement On The Oil, Gas and Solution Mining Regulatory Program : Well Permit Issuance for Horizontal Drilling And High-Volume Hydraulic Fracturing to Develop the Marcellus Shale and Other Low-Permeability Gas Reservoirs . The public comment period is open until November 30, 2009.